Dang it,” I whispered as Lew made his way around the corner where I was standing. The big bull moose – the only one we’d seen in like, forever – had disappeared into the willows and was gone. “How can a bull that big, with such a huge wingspan and massive body, vanish so easily?” I asked. “I don’t know,” Lew said in a frustrated tone. But he did vanish, leaving us with nothing but a trail of river water and some mighty big hoofprints in the soft gravel we were now standing on. Choosing to chase him was a decision we had to make in only seconds to decide, but it made sense. Moose meat is much better than bear, even though we had a good bear coming towards us from the other direction. I guess it’s just the way it goes sometimes. I’VE HAD TO MAKE a lot of those last-minute, split-second decisions throughout my time here in the Arctic, moments I’ve wished I was somewhere else rather than where I was. I’ve lost count, actually, of all the times I went left when I should have gone right, but, oh well, hindsight is 20/20, as the old saying goes. It’s also hunting and I’m reminded of it quite often, especially when the anniversary of Sept. 11, 2001 rolls around. My first fly-out, do-it-yourself drop hunt ended the same way. A few days before that fateful day, we flew north to a place that is well known throughout this region, the infamous Kelly River. It lays about 90 miles north of Kotzebue and was once known as the premier spot for hunting moose, bears and caribou. It was on everyone’s hit list in those days, and if you wanted a chance at all three species, then the Kelly was where you went. It was also the first time my wife Susie went with me. We had a great time, even though the rain poured for most of the trip and finding a piece of dry firewood was next to impossible. We hunted hard, glassing and searching every day for what would be hopefully my first moose. Like all hunts in Alaska we had choices to make, whether right or wrong. The biggest were, where should we go and in what direction? We decided to hunt north of camp and searched from a small hill that gave us the best advantage. It was futile and in the four days we were there we didn’t see anything except for mosquitoes and an awful lot of blueberries. But as it seems to go in these scenarios, on the day we flew out, which was the evening of Sept. 10, 2001, we saw from the plane what we had missed. Immediately we knew we should have turned our attention south. Three big bulls with massive headgear were feeding in the low-lying willows not far from camp, within easy packing distance of the plane. Crazy, right? Just the way it goes, I guess. Chalk that one up on the learning curve. MY HUNTING PARTNER LEW Pagel and I have experienced this more times over the years, choosing to hunt this river drainage over that one, the far mountain instead of the closer one. Now, I’m not complaining; we’ve had good luck more times than not. But many of those decisions were based on weather more than anything else. Like today, for example. The wind is killing us – it’s blowing 30 mph and whitecapping Kotzebue Sound. Sure, we could risk it, and in my younger days I probably would have. But not today – too dangerous. Many will go anyway and get wet, as well as risk swamping their boat, or worse. So here we sit waiting, watching Weather Underground on our phones and hoping. It’s like being in purgatory. Just recently Lew and I were hunting bears in a prime spot that we’ve hit many times before. It’s legendary for big grizzlies and one of those places with muddy sand bars deepened by bear tracks and half-eaten dead fish laying everywhere. It’s a great spot if you want a grizzly; this is where you go. We eventually made it there in the boat and camped at our normal spot, one that we’ve used for years. Our plan was to grab a quick MRE and then boat upriver that evening to sit and wait. Unlike most hunters who come north and stay for a week or 10 days, we only had the weekend, so our plan was to get in and hunt hard. The weather was great – no wind or rain – making for one of those perfect evenings when bears like to make their way to the river for supper. The fish, flopping and going crazy in the current, were a blessing too: big multicolored chums slapping constantly – creating the proverbial bear dinner bell – and trying to get to who knows where. We took the ride upriver, made landfall and anchored up. It was primetime for us too and we were ready. In no time we had a bear swimming the current towards us. He was further up than we were, but the current was pulling him towards a small island 300 yards away from where we sat watching. Lew asked me if I wanted to move the boat to the south end of that island. I looked and yes, there was a perfect sandbar that actually provided cover and would make for an easy shot from that distance. I hesitated, thought it over and finally said no. Looking back I should have said yes. I just didn’t think he would come directly at us. I figured he would go the other way into the wind, but I was wrong, and my decision proved to be one I would regret, especially after getting a closer look at the size of this grizzly. He was huge, but with my indecision it was too late to move. The sound of the motor would have ended our hunt and he would have left in a hurry. We watched and waited as the big bear headed straight for the sandbar. “Damn,” I whispered. For a moment I contemplated wading to the spot, but I knew the current lay deep in a small part of the river and my hip boots weren’t up for cold water, and neither was I. All we could do was watch and hope. He kept walking without a care or scent we were there, stopping here and there to dig at a dead fish. I had brought both my bow and rifle on this trip. From where we were he was 334 yards, too far for either. Finally, he walked along the sandbar, which would have been an easy 30-yard bow shot. But I wasn’t there to make it. All we could do was watch as the bear turned north and walked out of sight. “It’s just the way it goes sometimes,” I told Lew. WE FELT EMPTY AND decided to float downriver back to camp, but like all things in the Arctic, when dusk approaches weird things can happen. After pulling anchor, we began to drift, using a wooden pole to keep us off the bank and out of the willows. Looking ahead I could see him – a big bear walking the edge of the bank looking for fish, stopping and posturing like he owned the place. No doubt he was big, but not as big as the one we had just left and the one I was still thinking about. Could it be that two bears were within a short distance of each other? In Alaska you can shoot from a boat or raft, as long as the motor is off. Our motor was off with me scrambling to find a good rest for a shot. I finally achieved a decent rest on the back of the swivel seat and peered at him through the scope. I needed him to stop, and not only would he not stop but he began to run towards something to his left. I raised my head to look and could instantly hear Lew say, “Sow with cubs.” Boars will eat small cubs, and these were small and so was the sow. The big male was trying to catch one of the cubs and the sow was attempting to warn him off in another direction. She did a good job as they played getaway in the willows. It was utter chaos! Bears were darting in and out of cover in every direction. I slipped the safety off the 7 Mag and waited for the big guy to stop, but he would not. It was then that Lew touched my shoulder and pointed downriver maybe 200 yards. Four more bears had made their way to the river – one on our left and three on the right. It was a “bears gone wild” episode and we sat there in awe of the show! For most this would be a sight to see, and believe me when I say it was. I didn’t know what to do, so I decided to just slip the safety back on and watch. And so we did. We watched until dark as bears growled, chased each other and fought like crazy. We watched them pull fish from the water, devouring them as fast as they could, all the while eyeing each other from a distance. It was an incredible evening and not something we wouldn’t soon forgot. Editor’s note: Paul Atkins is an outdoor writer and author from Kotzebue, Alaska. He has written hundreds of articles on big game hunting, and fishing throughout North America and Africa, plus surviving in the Arctic. 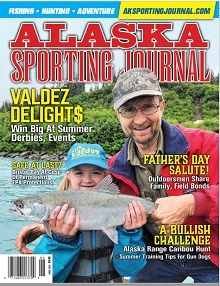 Paul is a monthly contributor to Alaska Sporting Journal.